A global trade dispute is brewing over the rare metals inside many of our favourite technologies such as smart phones or hybrid cars. Last year, an article published in Transparency International’s Climate Change edition of the Global Corruption Report warned about the corruption risks in the countries where many of these valuable raw materials are to be found, which could exacerbate any conflicts over access to them. The article by Stefan Bringezu and Raimund Bleischwitz excerpted below, “Preventing a resource curse fuelled by the green economy” warns that the race for these metals could trigger similar effects to the conflict and corruption seen in many oil rich countries, a “green resource curse”. 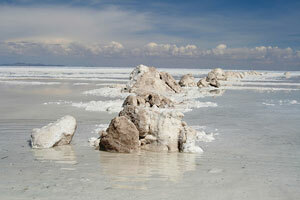 A boom in lithium demand would carry both the promise of financial prosperity and socio-economic challenges for Bolivia, whose estimated 5 million tonnes of lithium in the Uyuni salt lake may represent up to half of the world’s known reserves. Natural resources should be a boon for any country that possesses them, yet abundant resources can lead to destructive consequences and open the door to corruption. There are many possible drivers of such a ‘resource curse’. Governments that depend primarily on revenues earned from natural resources may not need to rely on citizens to provide a tax base, thus avoiding one important form of accountability. In the absence of accountable governance, funds generated from natural resources may be mismanaged, poorly invested or siphoned off to an elite minority that seeks to concentrate power. Despite signficant additional revenue, social inequity and poverty may rise while long-term economic growth falters. In the worst instances, these conditions can contribute to public unrest or civil war. Mining, a second activity necessary to support the green economy, carries significant opportunities for corruption. The industry is believed to be one of the business sectors most likely to bribe public officials or to influence political processes unduly. The industry is characterized by opacity and confidentiality, which enable companies to conspire with government officials to rig the bidding process. By developing personal relationships with influential members of the political elite, or offering bribes, corporate representatives may secure contracts or political decisions in their favour. Host governments may launder money offshore or direct funds towards spending that benefits the interests of the political elite. What are rare earth minerals? Lithium ion batteries are expected to play a growing role in future demand for electric cars. Credit Suisse’s estimate of annual growth rates for lithium demand are about 10 per cent. Increased demand for lithium will lead to additional extraction activities at a limited number of salt lakes, such as in Argentina, Bolivia (read more on the Bolivia case here) and Chile. Gallium: used for LED lighting and solar panels. Demand for green technology development is forecast to exceed current total world production by a factor of six by 2030. This could lead to enhanced bauxite mining18 in countries such as Guinea, China, Russia and Kazakhstan. Tantalum: used in microelectronics such as mobile phones and PCs. Mining has increased in the Democratic Republic of the Congo, where the militarization of mining is well documented and illegal trade revenues have been linked to the financing of civil war activities. The market for rare earth metals, used in defence technologies and also crucial for low-fossil-carbon technologies such as wind turbines and hybrid cars, is worth some US$1.3 billion annually. China, one of the few countries currently mining rare earth metals, has considered significantly curbing or ending their export altogether, prompting a rush on mines in Russia, Kazakhstan, South Africa, Botswana, Vietnam and Malaysia. Rising demand for many of these mineral resources will probably coincide with a shifting pattern of mining activity. Emerging economies such as Brazil, China and India are expected to reach a period of high metal intensity. As mining companies from these countries transition from trading into production, they can be expected to meet domestic demand for raw materials through direct investment throughout the world, and particularly in Africa. This new buying power may not be matched by high standards in business integrity. In 2008 companies from Brazil, Russia, India and China were perceived by the business community to be among the most likely to engage in bribery when doing business abroad. If the resource curse can re-emerge in a low-fossil-carbon economy, so can solutions to prevent it. Various initiatives currently aimed at the oil, gas and mining industries are applicable to the resources necessary for a green infrastructure. Organizations including Publish What You Pay, the Revenue Watch Institute and the Extractive Industries Transparency Initiative promote the public disclosure of industry payments and host government earnings for oil, gas and mining concessions. Civil society actors can also make efforts to ensure that mining and land concessions are granted through open bidding processes, with transparent contract design and prior informed consent from affected communities. National governments are also taking a second look at their legislation. In 2010 Brazil limited the amount of land that foreign investors could purchase by closing a loophole that had allowed foreign investors to operate via Brazilian subsidiaries. The same year, Australian lawmakers debated the merits of an audit or registry of foreign-owned commercial agricultural land. Regulations aimed at enhancing transparency in the extractive industries will also have an impact. New US law will affect eight of the world’s 10 largest mining companies. In 2012 the Rio+20 Earth Summit will provide an opportunity to address open trade for critical metals and recycling. In the long term, the growing strain on many natural resources may be best addressed by an international agreement on sustainable resource management. Since this article was written, China, Russia and India have all taken the first steps to tackling foreign bribery by their companies.